At ﬁrst glance the new 5-Series looks just like a mini 7-Series, this isn’t a criticism or a bad thing because they are both very smart looking cars. The 5-Series has been around for over 45 years and it has consistently been a massive seller for BMW. This car has been driven for three million miles over four years and the engineers have ﬁne tuned everything and here we have the results of all of this hard work. It’s obvious to see why the designers don’t want to design something that’s going to upset future buyers but I think they’ve done a great job with this car. 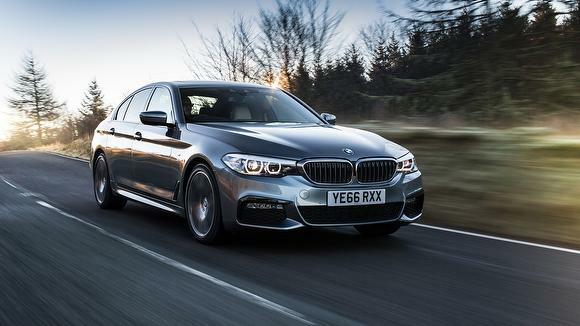 It not only looks like a real executive car but it has a clever balance of sporty touches thanks to the M-Sport tweaks, deeper front and rear bumpers, subtle side skirts and lovely 19″ alloys. The new enlarged kidney grills hark back to the early 5-Series and they really help give this car an aggressive look from the front. I drove the 530d with the optional X-drive. The engine produces 261bhp and it gets to 60mph in 5.4 seconds. It’s very quiet, you can barely hear it at tick over but when worked hard, it does have a great sounding growl. Thanks to Syntak technology the engine is encased with soundproof material. The best seller in the range is going to be the 520d which will account for a staggering 80-90% of sales. The new 5-Series is 100kg lighter than the outgoing car, thanks to the use of aluminium panels; it has helped shed loads of weight. Basically this is the Slimming World version! It is also 36mm longer and 6mm wider meaning passengers sitting in the rear now have more leg room than most other rivals. The boot capacity has also been increased by 10 litres to 530 litres. Thanks to this the current car is 11% more economical and 10% quicker than the outgoing model. Factor in the aerodynamic shape and its class leading 0.22cd ﬁgure, this car literally glides through the air. Because of the cars aerodynamic shape and the acoustic glass, wind noise is kept to a bare minimum. Potential owners can opt for the Integral Active Steering which is only available with cars ﬁtted with X-drive BMW’s 4-wheel drive system. The electronically controlled set up turns the rear wheels in the opposite direction to the front ones to signiﬁcantly improve manoeuvrability. At high speed the rear wheels point the same way as the front, thankfully! This helps sharpen turn in and boosts stability. All 5-Series get Driving Experience Control which gives the driver access to comfort, sport and eco pro, each tailoring steering and throttle responses to suit conditions. The optional adaptive dampers priced at £985 help tense up or soften depending on which setting you chose. The system constantly monitors your driving style. This option mated to the Professional Infotainment System works to unlock the Adaptive Mode. This works with the satellite navigation system to continually be ready for upcoming hazards like a sharp bend or junctions. The car I drove had 19″ alloys and combined with the adaptive dampers, helped give this motor a very comfortable ride, especially in comfort mode. BMW’s Autonomous Driving set up gives the car the ability to accelerate, brake and steer up to speeds of 130mph. It works really well but it does require you to keep reminding it that you are awake and paying full attention, although The Hoff had plenty of faith in Kitt, I’m not sure if I could trust a car to drive itself, personally. The car now has a few gadgets that were originally seen on the 7-Series, LED headlights are standard throughout the range, gesture control works to mute or increase / decrease the volume or to answer calls. The car’s interior just has a real quality feel about it and it is up there with the competition, all buttons and switches just ooze quality. The dash is dominated by a 10.25″ screen which is very user friendly and it works by either using the rotary dial or touch screen. Apple Car Play is an optional extra priced at £235 and I’m surprised it wasn’t ﬁtted as standard. BMW have priced the car at £36,025 and the range topping 540i Sport comes in at an eye watering £49,945! After spending a few days in this car I really didn’t want to give the keys back. I really can’t wait to drive the M5 when it’s launched as that is going to be one hell of drivers’ car. Car supplied by Lloyd Newcastle.